This site is dedicated to the memory of the greatest Gospel singer of all time. James Blackwood, End of an Era? James had been waiting for the release of this special collection of songs for a year or two. It is sad that he did not get to see this dream finally come to pass. Rock-A-My-Soul is a 5-CD boxed set and it contains the first eleven albums he and the quartet recorded on the RCA Victor and RCA Camden record labels. 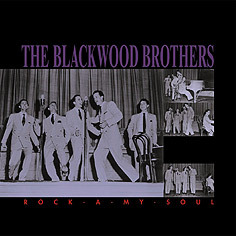 Included are: FAVORITE GOSPEL SONGS AND SPIRITUALS, HYMN SING, I'M BOUND FOR THAT CITY, HIS HANDS, THE STRANGER OF GALILEE, PARADISE ISLAND, IN CONCERT, THE KEYS TO THE KINGDOM, GIVE US THIS DAY, GLORYLAND JUBILEE, and the RCA Camden album titled THE BLACKWOOD BROTHERS. Also included is an 82-page book written by Charles Wolfe, with over 70 pictures, many which have never been published before. It also includes a complete discography by Paul Davis & Richard Weize. This website is endorsed and maintained by the family of James Blackwood, Sr.
All Content (c) 2018 Jimmy Blackwood Ministries, Inc. or used by permission. Unauthorized reproduction or retrieval of images, text, audio or video files without prior written permission is strictly prohibited.